It’s hard not to be wowed by most Autoart Signature Series models, this is diecast near its peak. 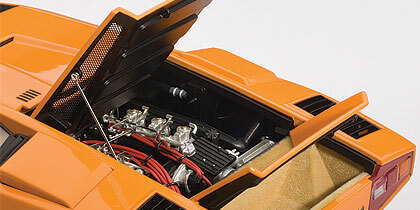 And there’s a lot of wow factor with a bright orange Lamborghini Countach LP400. You may need sunglasses to examine it up close. 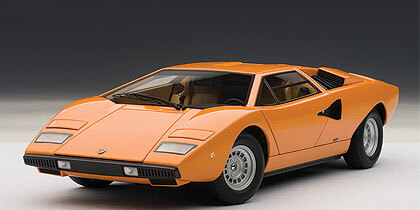 Countach was the first Lambo to go full bore with the wedge shape and sharp angles front to rear. It was launched at the 1971 Geneva Auto Show and praised for breaking through the styling envelope and taking the wedge shape to an extreme. 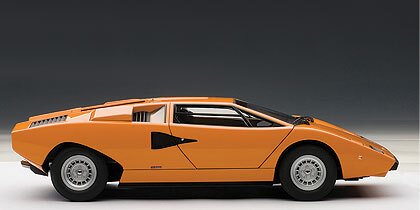 Some folks consider Countach the first true supercar and it’s hard to argue that, at least from a styling standpoint. This broke all the rules and norms. Performance was no slouch either. The real car got its power from a monster mid-engine V-12 that made 375 horses, considerable for the time and with all the body panels made of aluminum this had a great power to weight ratio. Under that lightweight body was a space-frame made from curved 40mm tubular steel for strength too. 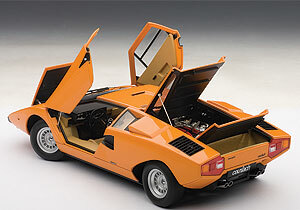 Countach was produced from 1974 through 1990 as the bullish Italian carmaker continued to press the styling envelope with new models such as the Diablo, Gallardo and Aventador. The LP400 was made only until 1978 when an LP500 was offered. 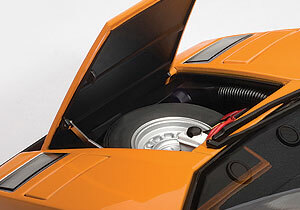 Everything opens on the Countach, including its clever scissors doors. Autoart’s model is highly detailed, which you’d expect at this price, that and this being a Signature Series model. The impressive Lambo is made of 291 parts, including 21 zinc diecast bits, while more than 100 others are photo-etched or made of other metal. Paint and fit and finish are stellar to give the car a high-end look, plus Autoart uses fabulous photo-etched grilles on all the air inlets to give it a realistic appearance up close. Autoart tells us the car gets 106 free-hand spray painting passes to get such an even, deep and rich finish. Another plus, the car features pop-up headlights operated by a lever under the car’s nose, plus the car’s scissor-style doors open wide to reveal a beautifully detailed dash with all sorts of dials and knobs that look realistic. Then there are Lamborghini’s low-slung tan designer seats that almost look like modern lounge chairs. A bold gear shift sticks up from the console too, with the gear shift pattern printed atop the black ball knob. Seat belts are realistic with well defined buckles too. The hood opens to reveal the spare tire and the rear hatch flips up to show off the well detailed and wired V-12. The wiring (blood red) is coiled and delivers an authentic look. One small thing of note, the tires have no brand markings on them, but are treaded. Wheels are plain matte silver, so all your focus is on the car’s fabulous body. Head and taillights look realistic, the front black-sealed running lights and turn signals are especially well done. While in back there are two dual exhausts. Imagine the roar that came from those on the real car. Only 150 of these limited production Countach models were made, so collectors have a much better chance of snagging an Autoart edition of the LP400. If you do land one, it’ll be a conversation starter, especially in this eye-popping bright orange! Autoart does a fine job of wiring and plumbing the V-12.